Out of all the pseudoscience, anti-science and outright science deniers I have met, anti-vaxxers are by far the most frustrating and disheartening to deal with. Fuelled by scientific illiteracy, conspiracy theories, fear and arrogance – the underlying philosophy of the anti-vaccination movement is that disease is better than vaccinating. I could never really understand the idea that disease was better than vaccinating, so I decided to go out and do some digging into what makes the anti-vaccination movement tick. This is what I have found. They mistake their ignorance for knowledge while display an air of arrogant superiority (also known as the Dunning-Kruger effect). The Dunning-Kruger effect is a cognitive biases where people have an inability to realistically assess their level of competence or incompetence. This happens when a person cannot see that they aren’t as skilled as they think they are. 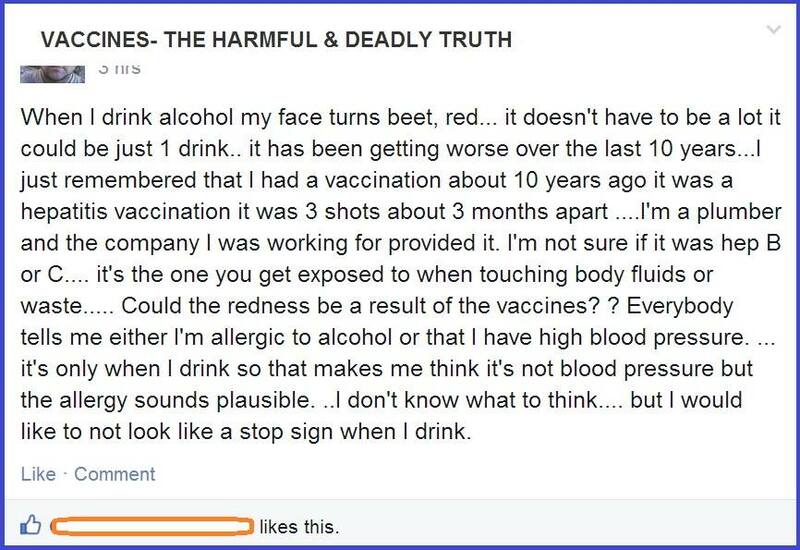 This happens a lot with anti-vaxxers, many mistake themselves as authorities on vaccine research – despite only reading research they 1. can understand and 2. agrees with their preconceived ideas about vaccines. They know enough scientific terminology to sound convincing, even if they don’t understand science. We live in the age of science and information but sadly also pseudoscience and misinformation. It is harder and harder for people to understand science when you spend most of your time picking out pseudoscience to get to accurate information. The anti-vaccination however has cottoned on to the fact they should have at least a basic scientific understanding to help with bringing more people into anti-vaxxer fold. By “basic understanding” I mean, many of them know scientific terminology, they may even know how to read a scientific paper but due to the high level of bias around vaccines, their scientific knowledge is either incorrect or ill-informed and full of holes. However it does sound nice and convincing to a person who has no understanding of science and is confused and scared. Underneath their science sounding exterior is a pseudoscience, science denying centre. As mentioned previously, the anti-vaccination movement and its members have learned to sound convincing but underneath the science sounding exterior is a deep well of conspiracy theory and science denial. Anti-vaccine science denial is evident in the fact that despite the overwhelming evidence that vaccinations creating a high level of herd immunity have reduced and eradicated diseases that 50 years ago were killing and maiming thousands of people – the anti-vaccination movement still chooses to ignore the evidence in favour of “parental instinct”. The anti-vaccination movement wants to undermine public health. The anti-vaccination movement with the assistance of the alternative medicine industry is attempting to undermine public health by demonising vaccines through the use of scare-tactics to discredit vaccines and the work they do. Alternative medicine practitioners want more confused and scared customers through their door to line their own pockets. Meanwhile anti-vaxxers seem to want a vaccine free world without understanding the implications if that were to happen. Anti-vaxxers have never seen the seriousness of widespread disease. Most anti-vaxxers will tell you they don’t vaccinate due to the risk of adverse reactions from vaccines. Because each human is different, vaccines may have different effects on people – just like food. Some people get an upset stomach from milk, some people are allergic to peanut butter – medications are no different. According to the Understanding Childhood Immunisation booklet released by the Australian Government: “A small percentage of people may have reactions to vaccines such a bruise or a rash – a smaller number may have more severe reactions. The small risk of getting a rash or bruising after the MMR vaccine is 1 in 350,000 which is small amount when weighed up against the effects of measles. Complications of measles include ear, brain and lung infections, which can lead to brain damage and death. Approximately one child in every 1,000 who contracts measles will develop inflammation of the brain (encephalitis). For every 10 children who contract encephalitis, one will die and up to four will have permanent brain damage. If 10,000 children contract measles – 10 children will contract encephalitis, one of those children will die and up to four will have permanent brain damage”. Vaccines have created an “out-of-mind, out-of-sight” scenario lulling us into a false sense of security. The Anti-vaccination movement has clearly never experienced a child or sibling in an iron lung or dead from disease. This fact alone contributes to their lack of understanding around the essential nature of vaccines and the role they play in the health of the population. They rely on the ideal that people should have the right to the medical care they think works, rather than the medical care that does work. This is something that is promoted not only in the anti-vaccination movement but within the alternative medicine industry as well. The personal choice argument. The idea that people should choose the medical treatment they think that works rather than medical treatment that actually does work. It’s a great method to get people away from medicine and into the arms of alternative medicine – doctors don’t give you are choice of treatments and the self-empowerment route is a good way to get people to think alternative medicine respects you as an individual to sell you magic water. Some people choose to take garlic and horseradish to fight off an infection, others choose antibiotics and unlike garlic and horseradish – antibiotics actually work. Largely this tactic is a sham, treatment for disease has nothing to do with respect or personal choice. It’s about treatment that works and making sure people go home healthy. In the words of Dr. Gregory Poland and Dr. Robert Jacobson from the Mayo Clinic “Ultimately, society must recognize that science is not a democracy in which the side with the most votes or the loudest voices gets to decide what is right”, parents don’t get to choose what treatment will treat a disease and work. They don’t get to choose whether eating cinnamon will treat Syphilis over Penicillin simply because they don’t like Penicillin. Penicillin is going to work against Syphilis because it has been proven to work. You can’t will a spice to treat disease simply because you think it will. The personal choice argument is harmless only to the person making the choice of alternative medicine over medicine, if that choice affects them and them only. Those who choose homeopathy over chemotherapy for cancer are only harming themselves. Vaccination on the other hand is a different story. By parents making the choice not to vaccinate, not only are they putting their children at risk but also the lives of the people in the wider population. Some children and adults cannot get vaccinated therefore they rely on the herd immunity of the community around them to protect them from infectious disease. Getting vaccinated is a social responsibility – not a personal choice. The deny herd immunity exists to discredit the fact vaccines work. In order for the anti-vaccination movement to continue, they need to deny the underpinning framework of vaccinations. One way in which they do this is by denying herd immunity exists. Herd immunity is one of the ways vaccinations protect people from disease. When you get sick, your body creates proteins called antibodies to fight the infection. The next time you are exposed to that same virus or bacteria, those antibodies keep you from getting sick again. Vaccines do the same thing except you don’t need to get the infection first, which means you don’t run the risk of complications or death that come with getting an infection. Vaccination gives us immunity without us having to experience the disease. The treated pathogen is then combined with other ingredients, such as stabilisers and preservatives, to produce a vaccine dose. While the virus or bacteria is a pathogen, an antigen is any substance that is recognised as foreign and stimulates the production of antibodies. The antigens in the vaccines stimulate the body to create antibodies to the disease, meaning if you ever come in contact with the disease – you already a store of antibodies to fight it off (source). Vaccines are essential because while the human body can produce antibodies to disease, the human body can’t always produce enough antibodies in the time-frame and quantity it needs to fight off infections and disease. Herd immunity happens when a high percentage of the population has been vaccinated against disease, herd immunity provides protection for those who cannot be vaccinated against disease. Herd immunity is vital because it can stop the spread of infection. When you have a large number of people vaccinated against disease – that is people who have enough antibodies produced by being vaccinated to fight off the disease – the disease cannot spread to people who cannot fight off the disease. They deny the risk of disease to justify the fact they won’t vaccinate. In an effort to downplay how essential vaccines are, the anti-vaccination movement will often downplay the seriousness of diseases. Along side denying herd immunity exists, denying the seriousness of disease is often used as a way to discredit vaccines. They will downplay the seriousness of disease to make parents feel the risk of reactions from vaccines are worse than the effects of a disease itself. The alternative medicine industry promotes vaccine denial as a way to get more people using alternative medicine (which increases profits). The alternative medicine industry has used vaccine denial and scare-tactics to drive people away from medicine that works, to drive people through the doors of alt med. It’s akin to a person scaring you into not taking a headache tablet to get rid of a headache so they can sell you a headache tablet they made – one that doesn’t work. Homeopaths especially scare people away from medical treatments to sell their own treatments. Vaccines are no different. Many homeopaths and naturopaths will scare people away from vaccines in order to sell people their own version of the same thing – except their version is untested and unproven. They are fuelled by conspiracy theories and distrust of everyone who doesn’t feel the same way. The anti-vaccination network is largely fuelled by a distrust of doctors, conspiracy theories involving scientists and vaccines manufacturer wanting to keep people sick to further profits which is influenced by a lack of understanding around science and a lack of critical thinking skills. Confused scientifically illiterate people are easily scared by chemicals and scientific concepts they don’t understand. The anti-vaccination network being prone to scientific illiteracy under the guise of arrogance and the Dunning-Kruger effect means a further retreat into science denialism. Anti-vaxxers want vaccines to be tested against placebos in regards to they’re effectiveness against disease, (saline) forgetting that doing so would be highly unethical. Vaccines are tested in randomly controlled double-blind trials in Phase 1 and Phase 2 of the vaccine development process alongside placebos to see if they provoke any reactions in the test subjects. However, to test a vaccine in people where disease is spreading, you essentially would need to have control group of placebo receivers and a group of vaccine receivers – it would be unethical to condemn the placebo group to get a disease to test whether the vaccine prevents it. When a new formulation of a vaccine has been created, they are tested against the older vaccine (one that has the antigen removed) as the older vaccine has been already been tested for effectiveness. The older vaccine with the antigen removed can serve as a placebo because it isn’t actually doing anything in the participants system. Vaccines are tested against placebos to determine if the formula will provoke any adverse reactions, but in terms of vaccines being tested against placebos to determine whether they prevent disease is highly unethical especially since we have a multitude of data of the history of vaccine creation, that shows us vaccines do prevent disease. They have little ability to critically think and recognise that correlation doesn’t imply causation. The anti-vaccination movement is also largely fuelled by testimonials from parents who don’t understand that correlation doesn’t imply causation. Just because you noticed your child’s autistic traits a few months after their vaccinations doesn’t imply the vaccinations caused your child’s autism. The movement consists of people who hate disabilities or neuro-atypical children. I’ve spoken about this before. The anti-vaccinations movement often (despite evidence to the contrary) parrots the idea that vaccine cause autism. Conducting a brief thought experiment, even if vaccines caused autism while protecting against disease, people who choose not to vaccinate are saying “I’m not vaccinating because the fear of having an autistic child is greater than having a child dead from measles“. You’ll hear anti-vaccine proponents talk about their children being “stolen from them“, they’ll talk about how the “light went from my child’s eyes“. They will sprout stories about how their children were injured from vaccines and are no longer “normal children”. The anti-vaccination movement loves to use autism and autistic children as weapons in their agenda of having a vaccine free world. Despite the mounting evidence vaccines are in no way linked to autism, the anti-vaccination movement promotes the idea that an autistic child should be feared rather than loved and accepted. In an effort to demonise vaccines even more, the anti-vaccination movement has reached the point where they are promoting the idea that vaccines cause Shaken Baby Syndrome, you know, the thing that happens when abusers shake babies which results in injury or death. Some proponents will even use religion as a way to get people away from medicine and vaccines. Others will outright lie about the ingredients in vaccines (such as saying vaccines contain aborted fetuses, which they do not) to further their vaccine free agenda. The anti-vaccination movement have also spread a lie that vaccines can “shed” the viruses they carry which can make us sick. Endangering the herd: Are anti-vaxxers liable for the diseases they help spread? Could parents be held liable for not immunizing their children? A paper.